After over 2 months of living in hotels and with family we will finally have a home again! The search was really hard, and took quite a few viewings before we found one that worked for us. We actually almost found a house a couple of weeks ago but someone else beat us to signing the contract. Soon after that we found this home, but with the holidays it took the housing office a while to inspect the home and write up a contract. We feel like we totally lucked out finding this place. Our home is only 15 minutes for Fil to commute everyday and the village has a train station and grocery store. 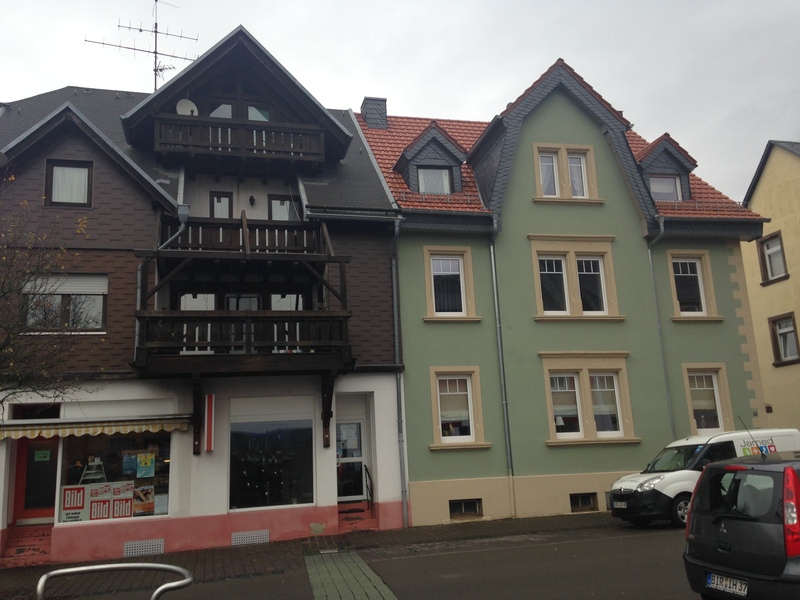 Fil also likes that it is only 15 minutes from the largest lake in Germany and just steps from the Nahe river. Our home actually looks a lot like an American home from the outside– which we weren’t necessarily looking for, really we just cared about the inside. 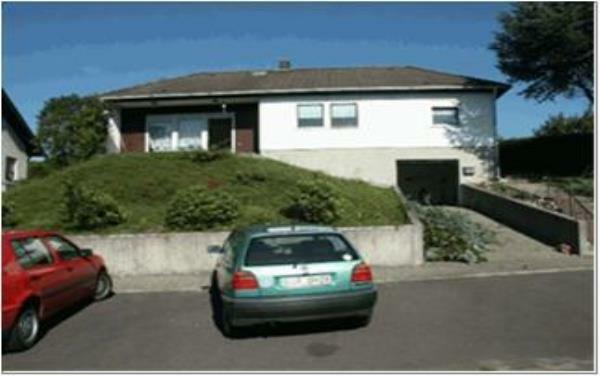 It is up on a hill with a garage in the basement. The entrance is actually around the back of the house (with a nice size stone patio), but both of us grew up using the back door of our houses as the main entrance so that’s nothing weird for us. You enter into a foyer with a half bath (a teeny-tiny half bath). German houses have doors everywhere! From the foyer you can open a door that leads to a hallway with connection to the 2 bedrooms, a large full bath, and the key-locked (thank god) door to the basement. Through the second door in the foyer is the living room with huge windows and a glass door that opens to the front patio which looks out over the village. Pocket doors in the living room lead to a second living room which we will use as an office/sewing room/guest bedroom. And finally, through the third door in the foyer is the dining room and kitchen. The kitchen is very small compared to American kitchens but in comparison to a lot of the other houses it is quite large. There is a stove top, small oven, cupboards and an extra counter space along the wall like a bar which is really nice since counter space is very limited. Missing is a refrigerator, which is not uncommon for Germany. The owner said the fridge broke and the last tenant would rather have more shelve space than a fridge so that is what they did. No worries though, the housing office on post will supply us with a fridge which we can plug in by the extra counter space. In the basement there is a very large laundry room with clothing lines to hang clothes, 2 or 3 hobby rooms with heat and windows, entrance to the garage, and the oil tank/burner is in a room of its own. With 2,000 sq. ft. we can stretch out and give Brock plenty of room to run around! Aside from the size and the location, the best part is that the house is one level plus a basement. All the other houses we saw were 3 levels plus a basement which would mean baby-gate city for us! Today we signed the contract that the housing office helped with since it is written in German and our household goods are due to be delivered in 3 days! Hopefully the appliances the housing office is lending us will be delivered the day we move in as well. But all that good news means that Baumholder is no longer our temporary home. 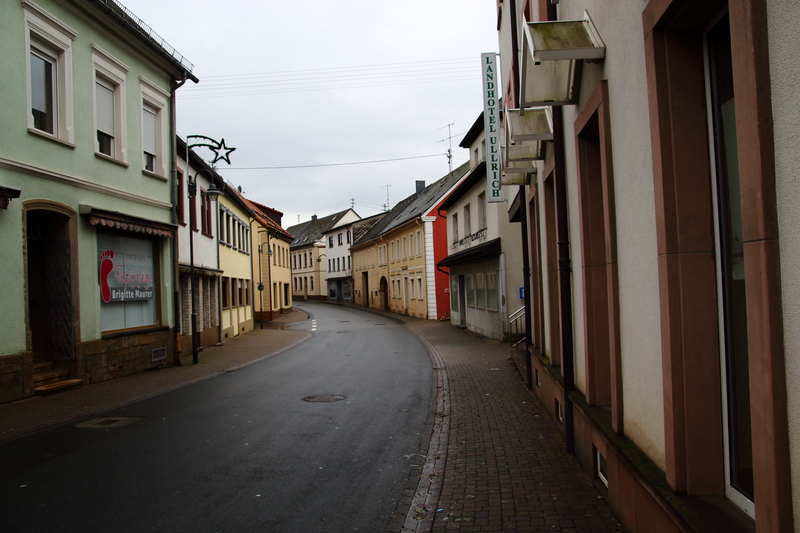 Although technically we were not in the village, we were on post, the village was still where we went to get used to Germany, where we started the search for a car for Fil (still in process), and where we went just to get out and away from the hotel. I’m sure you can see how grey the sky is– it’s pretty normal for here. 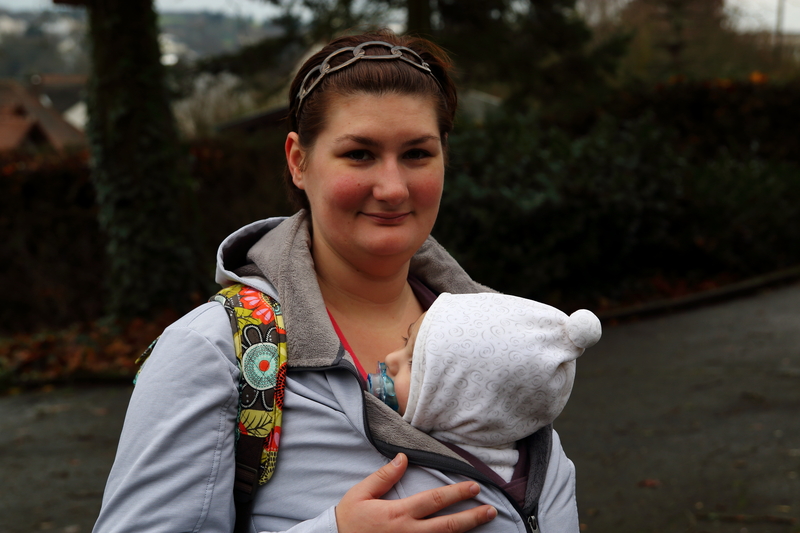 We don’t mind, we got to like the grey skies of Washington so we kinda feel at home. The weather so far has been mostly misty with some rain, and the temperature has been in the 30’s to 40’s. We did have a big snow storm right after Christmas which complicated our ability to go anywhere once things reopened for the holiday, but that is ok. I don’t think there is one straight road in the village, or for that matter all of Germany. They wind around and make sharp cuts up the VERY steep hills. Even outside of the villages on the open road it winds around. I know my mom will be car sick every moment she is here! 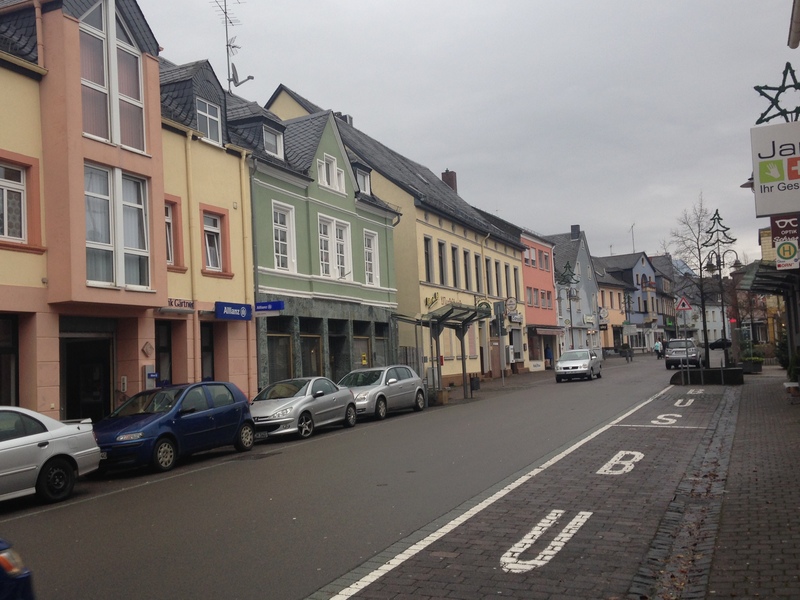 Like a lot of places around here, Baumholder has a really rich history. The oldest record of the area dates to 1,000 B.C. when farmers first settled the area. The name for the area has changed over time since it was occupied by the Romans, Franks, and then back and forth between French and German rule. We are very close to the French & Luxembourg borders– it is about an hour drive to the French border and another 3 to Paris :). As part of Fil’s in-processing a local woman gave them a tour of the village. She pointed out these two statues atop columns at either side of an entrance to a driveway. 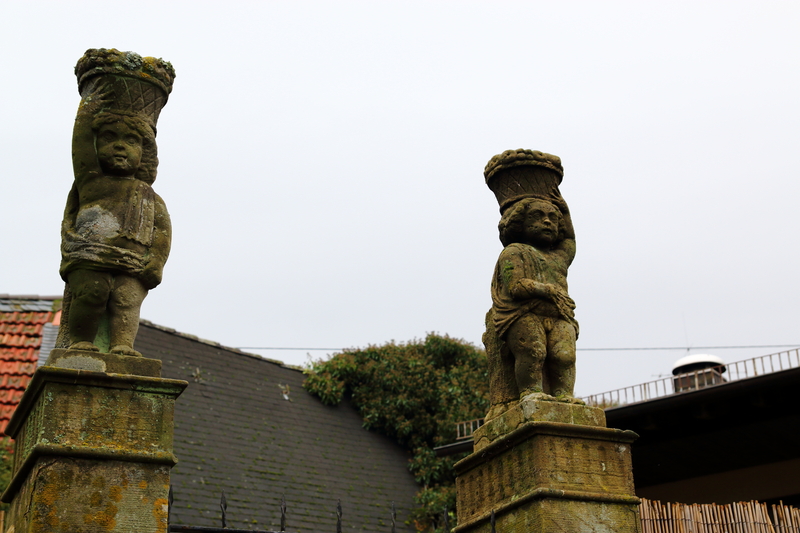 While the wall that ran along the alley had been rebuilt several times, these statues date back to the 1500’s and are simply decorating the back entrance to some lucky guys driveway. In the summer Baumholder is one of the hosting towns for the ADAC-Rallye Deutschland, which is part of the World Rallye Championship. The next Rally World Championship will take place in the Baumholder area on August 22nd & 23rd, 2015. The military training area with the famous “Panzerplatte” will again be the venue of two stages. Here is a highlight video from the WRC Rallye Deutschland 2014. Keep in mind that these are regular rural roads where the regular speed limit is 100 km/h (about 60mph) unless otherwise posted. Also notice how you don’t see stop signs. So thank you Baumholder for the introduction but it is time we move on. We are really excited to get settled in our house, and for the first time since he was born let Brock sleep in his own room in his big crib (after over 2 months of sleeping in the pack-n-play he is absolutely ready for comfort). P.S. I will send out change of address cards soon! Hope the move goes smoothly! Miss all of you! Sounds like you guys are really settling in! :) I’m so happy your home is so spacious, & your village looks absolutely darling!! So weird about the fridge, do you know what the previous tennents used instead?